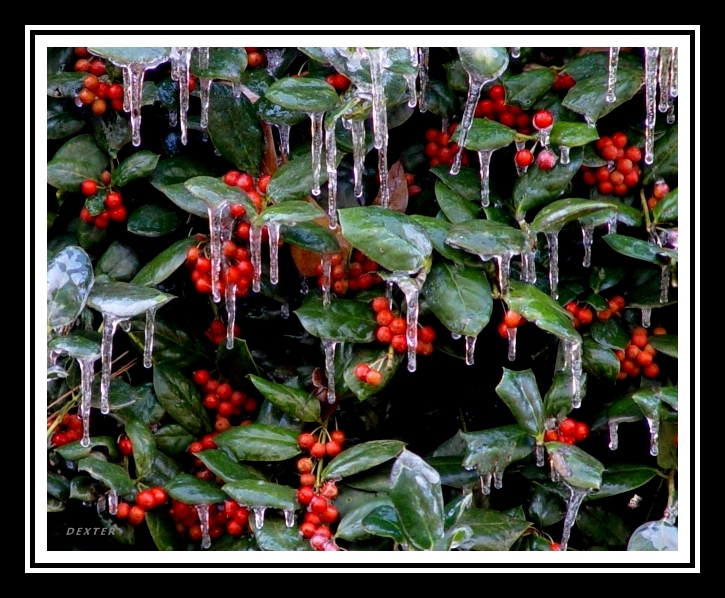 I made this photo during a past ice storm and would like to share its beauty with you. Old Canal Pottery would like to thank all of you who have supported the pottery through purchases, donations of materials or labor. It has been an exciting past year! As recently as the past two weeks, alterations have been made to the kiln using materials donated by supporters. These improvements would have been financially prohibitive without the generousity and efforts of the Augusta Canal Authority, Modern Welding Company and Thermal Ceramics Corporation. The improvements consist of two steel chimney extensions with heavy plate dampers and an additional 4 inches of ceramic fiber insulation on the kiln arch. These will greatly affect kiln handling and reduce fuel consumption. The kiln is loaded and we are awaiting better weather to try out the new modifications. I would ask you to think of those in this world with the least and remember them in your thoughts and prayers. As you settle comfortably in for the Holidays with your loved ones, try to keep in mind those who are sick, hungry or homeless. Make a promise to make a difference…help change the course of this world or someone’s fate by simply caring and putting forth some effort. Beautiful jpeg! I’m glad your kiln is getting the fine tuning it deserves. I hope you post a few of your pots after the upcoming firing. Btw, your call for empathy and action cuts straight through the flimsy veneer of the Santa Industrial Complex and gets to the heart and soul of what these holidays are supposed to be about. I’m right there with you. My dear friend, I have opened my own blog and hope we can be more in touch again –> http://mirroredlines.blogspot.com/Happy Holidays! Slaghammer, thanks for the compliment! My camera has suddenly stopped working…it’s digital so what do you do? I hope to get some more photos up after the next firing by borrowing a camera. I knew you would feel similar about the Santa/financial complex.Milena, it’s great to hear from you and I look forward to reading your blog! You’re a super artist and soul!Thanks Irene! I hope you and your family have a great New Year filled with great promise! Keep blogging! Hi Mike! I keep waiting on the weather to fire it up. If it’s not rain, it’s wind this time of year. The kiln is loaded, the wood is stacked so I’ll keep my fingers crossed a while longer.